This data set provides the results of controlled burns conducted to assess the flammability of mature forests on the Catuaba Experimental Farm of the Federal University of Acre - Rio Branco, Acre, Brazil. Controlled burns were conducted in 1998, and the rate of fire spread was calculated based on the duration of the fire and the measured extent of the burned area. Environmental variables measured included type of forest, canopy openness, leaf area index, number of days without rainfall, precipitation, height of litter, litter humidity, brushwood humidity, amount of water in the ground, air temperature, and relative humidity. Results from 50 fires set in 1998 are reported. There is one comma-delimited data file with this data set. These data are part of a larger study reported in the thesis by Elsa Renee Huamán Mendoza, "Susceptibility of primary forest to fire in 1998 and 1999: A case study in Acre, south-eastern Amazonia, Brazil". The thesis, in Portuguese, is included as a companion file with this data set. Figure 1. 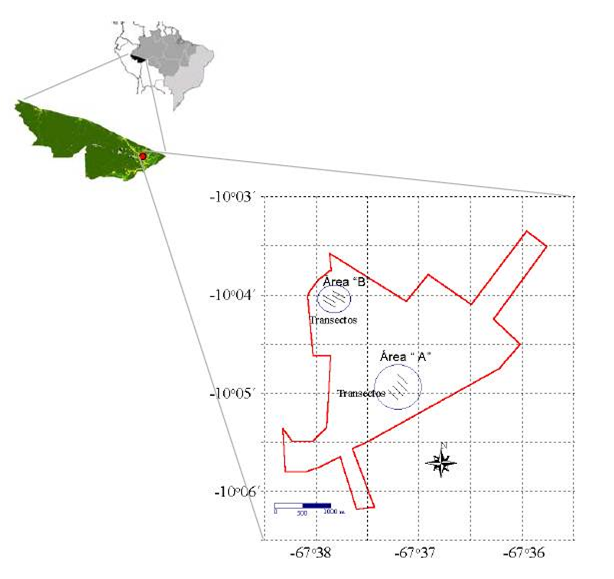 Study area located in the southeast of Amazonia: Catuaba Experimental Farm of the Federal University of Acre - Rio Branco, Acre, Brazil.. Transects were set up in two areas: Area A in the south and Areas B in the north. Both forest types were found in both areas. Each square represents 1 km2. From Mendoza, 2002. This data set was archived in May of 2012. Users who download the data between May 2012 and April 2017 must comply with the LBA Data and Publication Policy. The investigators were Brown, Irving Foster; Mendoza, Elsa Renee Huaman, and Nepstad, Daniel Curtis. You may contact Mendoza, Elsa Renee Huaman (elsa_mendoza@uol.com.br). Controlled burns were conducted in 1998, and the rate of fire spread was calculated based on the duration of the fire and the measured extent of the burned area. Environmental variables measured included type of forest, canopy openness, leaf area index, number of days without rainfall, precipitation, height of litter, litter humidity, brushwood humidity, amount of water in the ground, air temperature, and relative humidity. This file provides data on variables which would contribute to forest flammability. The data were collected in 1998 during controlled burns in a forest on the Catuaba Experimental Farm. 2 Year yyyy Study year. All measurements in this file were made in 1998. 6 LAI Leaf area index (LAI) measured using the LAI-2000 manufactured by Li-Cor INC.
7 Leaf_angle degrees Average angle of the leaf (MTA) measurements using the LAI-2000 manufactured by Li-Cor Inc.
9 Litter_hum % Forest floor litter humidity reported in percentage. The litter collection was made between 12:00 to 14:00 hours. 12 T_open degrees C Air temperature in open field away from the forest reported in degrees centigrade, measured by thermometer located near the experiment area. 13 T_forest degrees C Temperature in the forest in degrees centigrade, measured using temperature sensors on the ground. 15 Fuelstick_hum % Dry brushwood humidity reported as percentage. To determine the dry brushwood humidity, we used small sticks sensitive to the humidity called fuelstick. 16 Soil_water mm3/m2 Amount of water in the soil reported in mm3/m2. 17 Fire_ht_1 cm Average height of the fire at one minute in centimeters. 18 Flame_wdth_1 cm Flame width at one minute in centimeters. These data can be used to validate models designed to estimate fire susceptibility using remotely-sensed data. Refer to Mendoza (2002) for details on methods and measurements. The study area for the project was the Catuaba experimental farm, Acre, Brazil, located just outside of Rio Branco, with 800 ha of mature forest, owned by the Federal University of Acre. The dry season extends from May to October, and the rainy season extends from November to April. To identify conditions pertaining to fire propagation, small controlled fires were set in three forest types: open forest with palm trees, open forest dominated by bamboo (Guadua weberberbaueri Pilger), and a palm and bamboo forest mix. These areas are separated by approximately 2 km. Forest type was determined based on the number of bamboo stalks, the number of large trees, and openness of the canopy in a 10 m radius centered on the observer. In each area, eight parallel transects were established. Each transect was 250 meters long, 20 m away from its nearest neighbor. A total of 2000 meters of transects were set up: 750 m in forests within bamboo forest and 1250 m in open forest. Data collection was conducted during the months from July to October of 1998. Two measurements of canopy foliage were made. To estimate LAI, which is the foliar area divided by the area of the soil and reported in m2/m2 we used a LiCor 2000 instrument. This instrument estimates LAI via measurements of light interception at various angles (Cutini et al., 1998). The reading were done in the early morning (before 8:30 am local time) and in late afternoon (after 4 pm local time) to reduce the errors associated with the solar disk. The measurement of canopy openness (percent of the canopy where the sky is visible within the forest) was done monthly using a concave spherical densitometer (Forestry Suppliers Model-C). To determine the depth of litter prior to the experimental fire we used the four cardinal directions as reference points and measured 5 points (N,S,E,W and center). Litter was collected prior to the experimental fire and may have been held in sealed plastic bags for up to 12 hours. After this period the material was weighed, then dried in an oven at 75 degrees C (plus or minus 2 degrees C) for 36 hours. Samples were weighed every 6 hours until a constant dry weight was determined. Water content of the litter was determined by the gravimetric method and reported as percent of dry weight. Humidity of the combustible material (branches from trees and shrubs less than 1.5 cm in diameter) was estimated using 30 fuel sticks (Fuelsticks) following the method of Schoeder and Buck (1970) as cited in Pyne et al. (1996). The material was weighed using a digital balance (precision of plus or minus 1 g). Water content of the litter was determined by the gravimetric method and reported as percent of dry weight. Temperature and relative humidity of the air within the forest were measured by HobosTM sensors that recorded air temperature and relative humidity automatically. Two Hobos were located in the forest with palms and two in the forest with bamboo, and they recorded temperature and relative humidity of the air every 15 minutes. To avoid interference from direct sun or rain and direct contact with the soil surface, the Hobos were placed in PVC boxes situated approximately 1 cm above the soil surface. Air temperature in an open field located near the experimental area but away from the forest was measured by thermometer. Soil moisture was measured in soil pits made with augers to a depth of 7 m. Soil samples were collected from the following depths: 0 to 10 cm, 30 cm, 50 cm, 100 cm, and at intervals from 100 cm to 700cm. Soil moisture content at each depth was determined using gravimetric methods. The soil samples were weighed fresh and then dried in an oven at 105 degrees C ( plus or minus 2 degrees C) for 48 hours and reweighed. The amount of water in the soil is reported in mm3/m2 to 7 m depth. Experimental fires were set between the hours of 11:00 and 17:30 local time. The locations of the experimental fires were randomly selected along the transects, and points were located at least 5 m away from the main transect line. The initiation point for the fire was demarcated with a metal ring 20 cm in diameter. At 50 cm from the center of this ring in each cardinal direction a metal stake was placed. Litter depth was measured and then the material was collected for measures of humidity. The litter collected was replaced by litter from the surrounding area. To estimate canopy openness, readings of the concave densitometer were done using the 4 cardinal points for orientation. LAI was measured at the same point the day after the burn using the LiCor 2000. After measuring the associated variables for fine combustible material and microclimate in the demarcated area, 20 mL of kerosene were poured on the circumference of the ring and ignited. At one and four minutes after ignition of the fire, the duration and area burned were evaluated. After one minute, measures of flame height and extent as well as area burned were made using meter sticks. Distance measurements in all four cardinal directions were made. The same process was repeated at 4 minutes after ignition. After the fire was extinguished either naturally or by force, the area burned was measured discounting the area within the ring of ignition (0.03 m2). It was necessary to normalize the data to the four minute time period in order to calculate the area affected by the fire assuming a constant radial advance by the fire, since many of the fires were extinguished before or after the 4 minute mark. With the help of formulas developed by Martin (1982) using the variables measured we were able to calculate the area burned. MENDOZA, Elsa Reneé Huamán Mendoza. 2002. Susceptibilidade da floresta primária ao fogo em 1998 e 1999: estudo de caso no Acre, Amazônia Sul - Ocidental, Brasil. 41 f. Dissertação (Mestrado em Ecologia e Manejo de Recursos Naturais) – Universidade Federal do Acre, Rio Branco. Cutini, A.; Matteucci, G.; Mugnozza, G.S. 1998. Estimation of leaf index with the Li-Cor LAI 2000 in deciduous forests. Forest Ecology and Management, 105, 55-65. Martin, E.A. 1982. Calculation and interpreting forest fire intensities. Can. Journal of Botany, 60, 349–357. Pyne, S.J. ; Andrews, P.L. ; Laven, R.D. 1996. Introduction to Wildland Fire: 2. ed.. John Wiley & Sons, New York. 769 p.